Wayne Mack’s book Anger & Stress Management God’s Way is one of his most concise, practical and insightful works, yet seemingly has flown under the radar as one of his most overlooked works. It now has a new cover done by its new publisher, P&R Publishing. Discover Anger & Stress Management God’s Way as well as reduced prices on Dr. Mack’s instructional videos at NoutheticMedia.com. 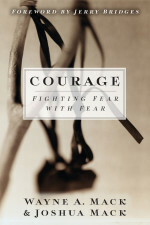 Wayne and Joshua’s Courage: Fighting Fear With Fear (formerly The Fear Factor) has arrived and is shipping now. The book, which went out of print in 2012 when its publisher folded, has a new publisher (P&R Publishing), a new, smaller format, a new title/cover and a LOWER price. We at Nouthetic Media believe it’s one of the Macks’ most underrated books and that it will be appreciated as a great book for small groups and Sunday School classes, as a discipleship counseling resource or personal reading. Good news! 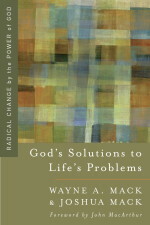 God’s Solutions to Life’s Problems arrived from the printer 1 week EARLY! This re-release of Wayne and Joshua Mack’s excellent discipleship book has been expanded with a 15th chapter, but the new publisher has dropped the price. Place your order now at Nouthetic Media and we’ll ship it after the books arrive (Update: expected Friday, Jan. 24). Also, sometime around Feb. 24, Wayne and Joshua’s Courage: Fighting Fear With Fear (formerly The Fear Factor) is expected to ship. We hope sometime next week to be able to provide a more firm release date. 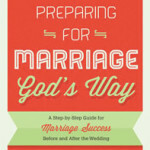 Preparing for Marriage God’s Way is back! We’re praising God that my book Preparing for Marriage God’s Way is back in print and available for purchase at a lower price than the first edition. Another praise item … the books God’s Solutions to Life’s Problems and The Fear Factor will also be printed early next year. All three are being published by P&R Publishing. Nouthetic Media, which sells all of my books as well as my audio and video resources, reports a very encouraging and enthusiastic response from churches, pastors and others who have already ordered my premarital book. Preparing For Marriage is back!